Attract the damsel of your dreams! A variety of carefully selected woods and greenery make this potion intensely masculine. Gives off an aura of steamy sexuality and confidence. Positively swoon worthy! Always a favorite! Comprised of a classically masculine blend of ingredients that tend to make the ladies weak in the knees. FERNS, GREENS ~ Strong sexual attraction, passion, adoration, confidence building. WOODS ~ Enhances perception of beauty, love, sensuality, money, luck, hex-breaking. RESINS ~ Sensual, sexually stimulating, lust, fertility, money. 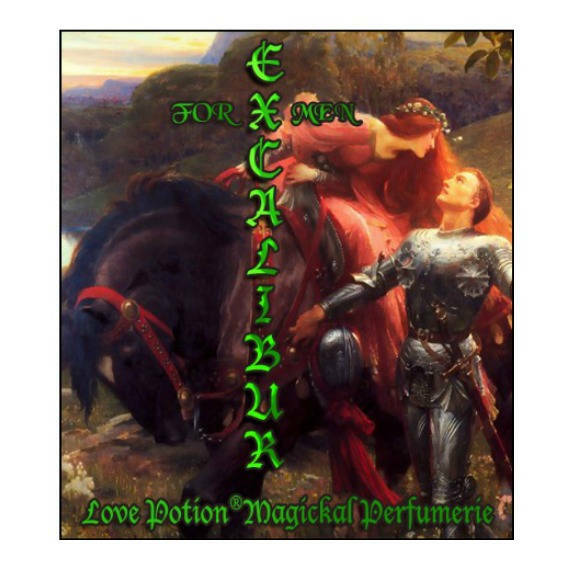 Excalibur is a part of our Permanent Collection.